We got a few photos from the new photoshoot of Aly & AJ for iHeart Radio. The ladies look so gorgeous in these photos, and we love their black and white outfits. We have added a few photos to the gallery, and you can also check out the interview of Alyson and Amanda for iHeart Magazine by clicking here. 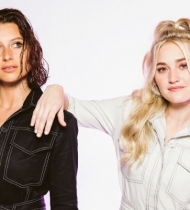 It’s been more than a decade since the release of their last full-length album, so it’s no surprise that Aly & AJ have rediscovered themselves on the music front. In 2013, the Disney alums attempted to rebrand themselves under another moniker (78violet), but quickly learned that their core audience was simply attached to Alyson and Amanda Michalka, and no amount of nostalgic cringe at teenage wardrobe or aesthetics could change that. Now, over 10 years since Insomniatic, the sister act has unleashed a new chapter of music, including the self-released 10 Years, a four-track ’80s-inspired EP, which combined their cooing vocals, heavy synth and their knack for tender songwriting. 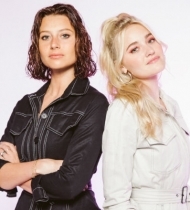 During a rare east coast appearance in conjunction with their tour for the set, Aly & AJ stopped by iHeartRadio HQ to discuss their latest single, former Disney days and just how they’ve managed to become principal businesswomen in the process.